Landscape & Nature Photography Blog: "Don't Shoot What It Looks Like. Shoot What It Feels Like." One of the most beautiful things about photography is that unlike other art mediums, it has the ability to record the world around us. It’s because of this that there is a certain expectation from some viewers that we shouldn’t “manipulate” our photos and that the photo is a close representation of what the photographer actually saw. For certain uses such as editorial and journalistic publications, the photos should absolutely strive to be an accurate representation of reality but for other types of photos is this an antiquated way of thinking? The pay for editorial is so mediocre these days perhaps it’s not worth losing sleep over. While I do not use nearly as much post-processing as some of my peers, I generally enjoy the creative process of interpreting my photos as I see fit. I’m not adding items that weren’t there and not removing elements to a point where it’s no longer what I saw. But at the same time I take creative liberties with highlight and shadow tones, saturation levels and in the case of this photo a conversion to black and white. 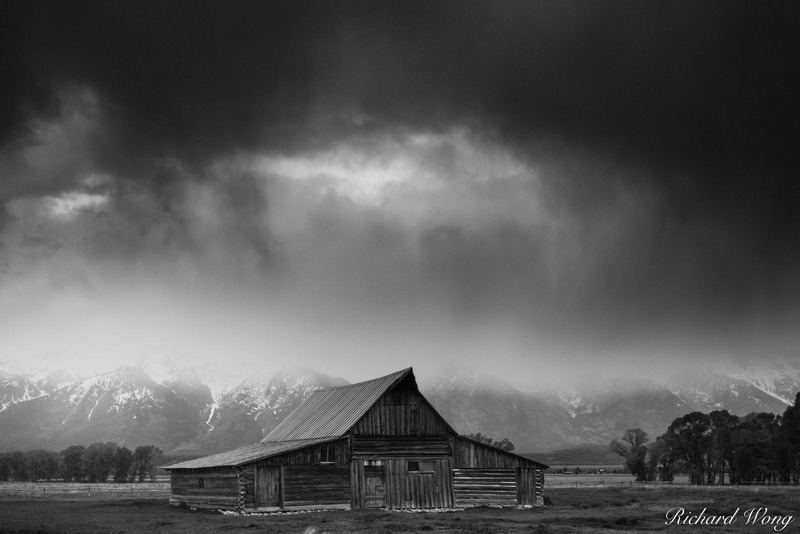 I originally had intended on processing this famous scene of “Mormon Row, Grand Teton National Park, Wyoming”, in color but after trying a black and white conversion I was able to better convey my emotional state while at this scene. So much of landscape photography these days is about bright and colorful sunrises and sunsets. I get it. Colorful sunsets are a universally-appealing subject and guaranteed to get noticed by others. They are also fun to photograph. I love photographing them myself. On the other hand it can easily become a formulaic way to create visually appealing images. There are so many other human emotions that rarely get tapped into within landscape photography that it is a disservice to the art to not explore them. At a recent lecture that I gave to the Peninsula Camera Club in San Mateo, I talked about how I was working on a book project several years ago not long after my dad passed away following a long battle with Parkinson’s Disease. The photos I ended up submitting were from locations that I had spent time as a child and the photos all had a melancholy feel to them. That gave me the idea to expand upon this and build up a portfolio of “Melancholy Landscapes”. Dreary, dark, sad; these are all feelings that we experience at some point or another in our lives. Who says that all landscape photography has to be bright and happy? Another talking point in my lecture was that I rarely pursue photography with the intent of creating beautiful photos. People occasionally compliment my work by remarking upon the beauty. While grateful for the feedback, I’m not all that interested in creating beautiful photos for beauty’s sake. My main priority in photography is to express a point of view. The objective is to shoot what it feels like, not what it looks like. Posted in opinion and tagged national parks, photography concepts.